Bhajias, also known as Pakoras, are best served on a cold, rainy day. 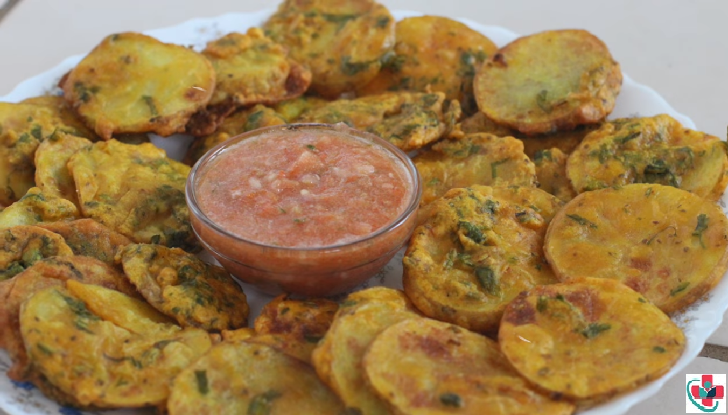 Popular in Indian and Pakistani restaurants and neighborhoods, bhajias provide a quick tasty snack. With all the rain and wind, we figured this would be a great treat to munch on as you watch the wind howling outside the window. We make the bhajias using potatoes sliced and covered in a batter before they are fried. Some folks call it Aloo Pakodi (Battered Potato) bhajia. Come on in and try ours, and then try your hand at making some. You can substitute potatoes for other vegetables. Cut the vegetables. Do not slice the vegetables too thick or too thin. Mix rice flour, gram flour, salt, cumin seeds, and turmeric powder in a bowl. Add enough water to make a batter of thick consistency. Heat the oil in a pan. When oil gets hot, add a tablespoon of oil to the batter and mix it well. Dip the vegetable slice by slice and slide into the hot oil. Fry on medium heat until golden brown. Bhajias are ready to eat. Serve hot with tomato sauce or green chutney.